The western entrance to the Western & Atlantic Railroad Tunnel in Tunnel Hill, Georgia. This is the way we entered. September 1, 2012. On the Saturday of Labor Day weekend, Betsy attended another pre-wedding event for her future daughter-in-law in Dalton, Georgia. While Betsy was partying, her son Jeff and I visited the historic Western & Atlantic Railroad Tunnel in nearby Tunnel Hill, Georgia. 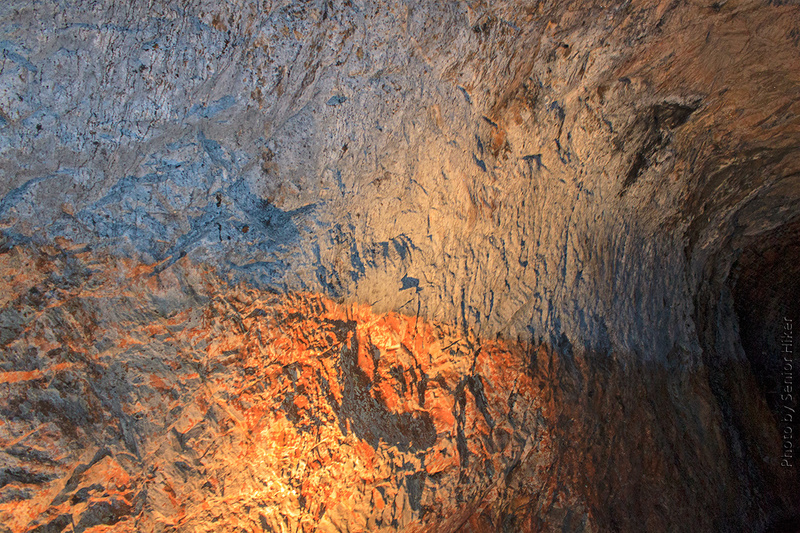 The interior of the tunnel, showing the layers of rock the workers had to cut through. September 1, 2012. The tunnel was built to connect the port of Augusta, Georgia, and the Tennessee River Valley. 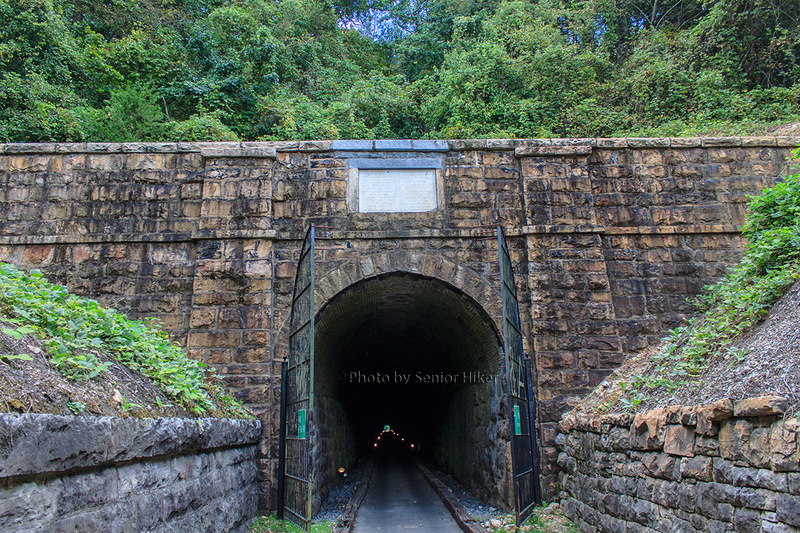 The tunnel is 1,477 feet long through the base of Chetoogeta Mountain, and it was designed to be the first railroad across the Appalachian Mountains. 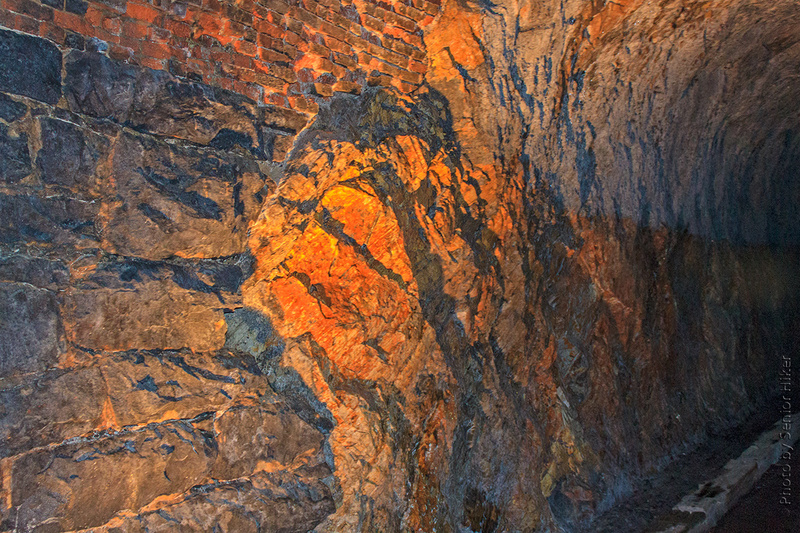 Another view of the rock inside the Western & Atlantic Railroad Tunnel. September 1, 2012. Construction of the tunnel began in 1848, and the first Western & Atlantic train passed through the tunnel on May 9, 1850. The town of Tunnel Hill sprang up during construction of the tunnel, and after the tunnel was completed Atlanta became one of the railway’s major hubs. The railroad tunnel played a part in several Civil War events, including the Great Locomotive Chase and the 1864 Battle of Tunnel Hill. After the Civil War larger train cars got stuck in the tunnel several times, which led to the building of a larger, parallel tunnel. The railroad stopped using the historic tunnel in 1928. The eastern entrance of the tunnel, 1477 feet from the western entrance. Tunnel Hill, Georgia. September 1, 2012. 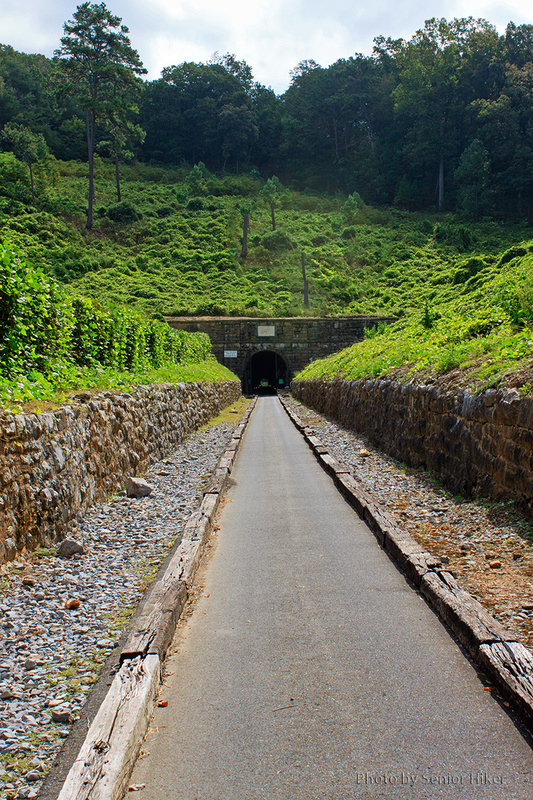 The tunnel suffered neglect for about 70 years, but in 1992 steps were taken to preserve and rehabilitate the old tunnel. It was opened to the public in 2000 in time to celebrate the 150th anniversary of the first train passing through. 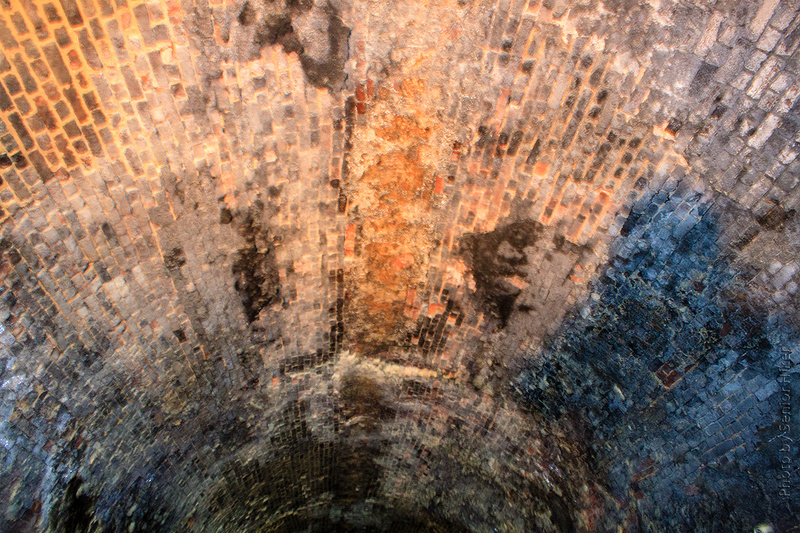 The ceiling of the tunnel. The black is soot from the wood- and coal-burning engines that traveled through the tunnel. September 1, 2012. I couldn’t take my tripod into the tunnel, so most of the interior photos are not very good. But it was fascinating to walk through the tunnel and remember that it was built with hand tools. This entry was posted on November 5, 2012 at 3:38 am and is filed under Our World. You can follow any responses to this entry through the RSS 2.0 feed. You can leave a response, or trackback from your own site. That first photo is amazing, seeing the hill above with the trees growing. Just knowing you are pretty much underground would be enough to make me a bit nervous. That is very interesting. There is a railroad tunnel where I grew up and I’ve always wanted to walk through it but I don’t know if there are places to get off the railroad if a train comes through while you’re in there so I’ve never tried it. when i enlarged the first photo, i thought GEORGE aren’t you afraid a train will come roaring out and run you over? then i read the story and found you were safe. i have been to Augusta many times, my brother lives there, but have never heard of the tunnel. i wonder if the Augusta end is open. What a fascinating post for the day, George, I do love the history!! I would really enjoy visiting here! Hope you have a great, if busy couple of weeks! Enjoy! I’m so glad the tunnel is open to visitors. Interesting story. Nice old tunnel. Several years ago we got to go through the 6 mile long Moffat Tunnel in CO on a train. What a fascinating place to visit. I vaguely recall the movie of the Civil War, “The Great Locomotive Chase”. Is this area close to that national park, “Stone Mountain”. I remember that they had on display there locomotives from various eras of steam travel in the USA. Good to see these historical places now preserved. PS: Fingers crossed for 1, 2, 10 and 24, eh? This tunnel is about 80 miles from Stone Mountain. It’s about 20 miles south of Chattanooga, Tennessee. This is a very interesting post, George. Our nation is young, relatively speaking; but there’s so much history here. It’s nice to see some of it being preserved like this. Wonderful piece of history associated with the tunnel. The viws of the tunnel are great. I recognize so many interesting places because of you. You’re doing a wonderful picture. How very interesting! As you know I LOVE history and you live where history starts LONG before ours does…THANK you for this post! I loved it! Very interesting post. I love especially those inside photos. I think it is scary going through it, claustrophobic people will not like that. How long is the travel through it? Somehow i will feel that it might collapse on me! But it is a lovely experience. Are there no creatures hiding in there, snakes perhaps? I was looking at the walls, and thinking they must have used hand tools to dig that tunnel. What an incredible amount of work!! Certainly not for the claustrophobic!! !